Lakshmi is in many ways the supreme mother Goddess of prosperity. Revered throughout Hinduism as the Goddess of blessings and wealth, she is also the primary Goddess of security and material comfort. She is often depicted holding a pink lotus and with golden coins showering upon her worshippers. She is connected with and often shown with the god Ganesh, the elephant-headed Hindu god of removing obstacles and bringing wealth. In the tantrik trinity of the triple Goddess (maiden, mother, crone) Lakshmi is the mother. She is today usually shown as the wife of the later-evolving god Vishnu, the preserver of the world, but her earlier husband was definitely the god Rudra. He is the red-skinned archetypal wild man, the god of storms and wild animals. He is the howler and ruler of the deep forests and lonely mountains. In fact, he is one of the ancient root-gods of the lord Shiva. A huge ancient festival of which she is a focus, the festival of lights in October, also celebrates her union with Shiva. This night all wives dance for their husbands, invoking Lakshmi and the fortune, prosperity, and success she brings. She is said to have been born when the demons churned the universe, the primal ocean of milk, as they struggled with the gods for supremacy. She was born from their chaos and churning, rising from the maelstrom upon a pink lotus and instantly filling all the gods and demons with happiness. She is one of the most popular Goddesses in India and as such she is worshipped by any and all, especially those in need of material prosperity or nourishment. Her earliest function was surely that of earth mother Goddess, and as such some of her very ancient images depict her as lying down, prominently displaying her yoni and having a lotus flower as a head. If you go into any Hindu-owned business or company, you will always find an image of Lakshimi or a small shrine to her near the cash register. She is prayed to every day by businessmen and householders to increase profits and bring economic prosperity and all Hindus believe that she helps them in this way! She is invoked as beloved Goddess MahaLakshmi, and as wisdom-mother she is the knower of all, the giver of all boons, a terror to the wicked and remover of all sorrows. She is the bestower of intelligence, success and worldly enjoyment and liberation. Thus she is without beginning or end, primordial energy, Goddess of all, a great power or ‘Shakti ‘! Always invoked as the Goddess seated on a lotus she is also seen as the creatrix of all in her form as the supreme Universal Mother. It is easy to see the universal appeal of this powerful Goddess! What makes her so favored by millions is the fact that she is a very practical Goddess who brings real tangible prosperity and wealth to her devotees. As such, we call upon her now to help us to bring wealth and prosperity to those in need! O auspicious one, giver of boons, MahaLakshmi hear our prayers ! MahaLakshmi namaste! Let us live in prosperity! Om hrim srim Lakshmi namah svaha! Become aware of the earth as one living being. It is one with your heart beat. Breathe deeply, feel the connection. Now you are done and must return …..
Now: Awake reenergized and ready for Prosperity! This spell is to give prosperity and the blessings of bounty to those people or places in need. BY YOUR SHOWER OF GOLD LET IT BE SO! IN THE GOLDEN LOVING SUN. Or anything else that needs a prosperity/wealth blessing! LAKSHMI SVAHA! OM HA SO! HONOR AND PEACE TO MAHA LAKSHMI! Lakshmi, the Goddess of wealth and prosperity can change your life for the better if you accept her Empowerment. Doing this empowerment says to the Goddess Lakshmi that you want her to be part of you, to protect, help, empower and bless you. It is not so much that she will make you wealthy, though she will bring you the money and the material things you need when you need them, but she will make you experience your life as one of pleasure and prosperity. Tired of having a ‘poverty’ mentality? Let Lakshmi into your heart and live a better, happier, more fulfilling existence AND gain the material prosperity you need! This should be done in the midday, a Sunday is best. You should do it inside or outside in a garden, but you should be alone and undisturbed for at least an hour. And it should be sunny, if possible. When ready, artfully arrange all the items on a small table or stone, sit and breathe slowly and relax. Imagine a circle of white light around you, protecting you and banishing all negativity. Open your eyes and meditate on the image of Lakshmi. BE HERE -BE HERE- BE HERE- NOW! OM HRIM SRIM LAKSHMI NAMAH SVAHA!……..
YOU ARE ME – YOU ARE ME – YOU ARE ME -NOW! Now, see yourself as the goddess Lakshmi, Goddess of wealth! MOTHER – EARTH IT ! MAY BE SPREAD ABOUT THE LAND! Take a big double handful of the coins an raise it abobe your head. With eyes closed, let the coins gently fall upon your head and sholders. In your mind SEE the golden coins and blessings of Lakshmi fill you and fill your home, your business, you bank accounts, you life and the lives of your friends! Feel the golden power of her settle into your body! 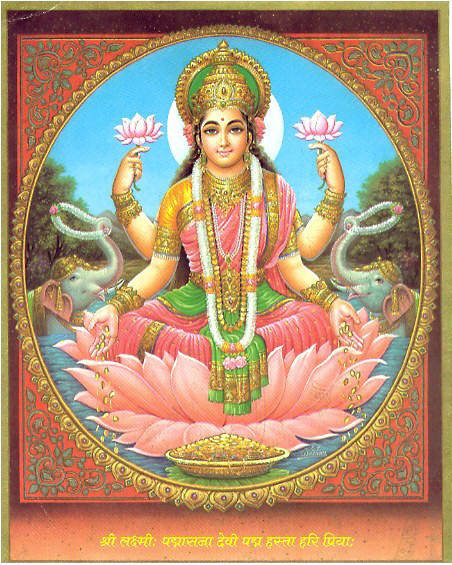 Sit and meditate upon the power of Lakshmi within you now, surrounded by the power of wealth and prosperity! Blow out the candle, put out the incense, take off the medallion. Clap your hands three times, then bury three of the coins in the earth somewhere, offering them to Lakshmi. The rest of the coins you must give as special prosperity love-offerings to friends, family and charities as well as to those who are in need. Keep only 3 of these coins in front of the Lakshmi Image.